Lens Description: High-performance, high-speed, ultra-wideangle zoom lens. A top quality zoom lens and very expensive aspherical glass element made with precision ground glass. Some shots have CA if you shoot toward bright lights like the sun. Some Out of focus visual fuzziness and mostly in DOF. Never a problem for me and this lens is better than sharp ! Built to take a beating and still work. Small and light to me and perfect for photojournalism work. This lens works fine on DX and FX bodies and you will be happy with the results. Don’t use a filter when shooting and try to keep away from direct light sources like any 20 mm lens and keep the front glass clean. I won’t trade or sell mine because the replacement is the 17-35mm 2.8 zoom made with plastic lenses inside and plastic can get an oil film on it when left in the hot sun ! You can’t clean it off because it is deep inside the lens. A real workhorse lens ! Just get one and use it ,if,you can find a nice one ! I’ve been looking to add a 35 f1.4!to my kit when I saw a video by the Angry Photographer. HIs video agrees with this review, so I decided to look for a clean used specie . I found an E+ used model locally for $699. I believe I’ll go and offer $600, and see what happens. 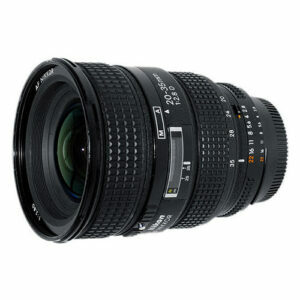 Otherwise I’m going to buy a Sigma 35 ART to match my 50 f1.4 which i am quite happy with. I’m shooting landscapes wit my D800 and Nikon Holy Trinity. I also have a Nikon 9105 f2 DC which is also an older Japanese D lens of fantastic quality.